Here in Southwest France spring is almost there. Time to get ready for your guests! We noticed that many of you are already busy with decorating your shop window - because of course this is how you need to consider your advertisement on Gites. Visitors of our website are window shopping to find their ideal holiday in France. And just like in a shopping mall of course there is something for everyone. Therefore make sure your window is as attractive as possible - sometimes it is time for a big makeover! Texts can be improved or completely changed, and some photos must be renewed. Don’t forget your prices! Just like in a shop, visitors like to know the price of the product they are interested in. Fill in your price periods to get more response. If you need our help, and you don’t find the answer on our site, please don’t hesitate to call us or send us an e-mail – we’re happy to help. In this newsletter we explain some new features of the site to meet the needs of the visitor. Sometimes a house sleeps 6, but a part of the house could also be suitable for 3 or 4 persons. Until recently it was not really possible to make that clear in your advertisement. Now it is: if a visitor is looking for a holiday home with less people than your maximum capacity, you can make it clear in your advert that this is possible. Provided that you have filled in these details, your house with the associated (lower) price will be shown in the selection list. If a visitor moves his mouse over the calendar, then the price with the corresponding capacity will be displayed. This is only possible within a certain range - a 20-person house where you can stay with your partner doesn’t seem to be logic. Searching for a certain town, area, region or department is now even more efficient for visitors of our website. Google Maps now displays search suggestions, which makes the quest more effective. You should try it yourself! Also the results for a visitor who was looking at a stay with a certain number of people are now more adequate. Earlier if a visitor was looking for 2 persons accommodations, also 30-person gites were displayed. We thought this was unlogic. Visitors will now see more relevant house sizes. The map is now calculated on the server and ready sent to your PC, laptop or tablet. This means an enormous improvement, especially for computers with less processing power and tablets and smartphones. Having a Facebook account is no longer reserved for the young and hip. Now we do not want say that you are not young and hip .... But many of you are the owners of such an account. 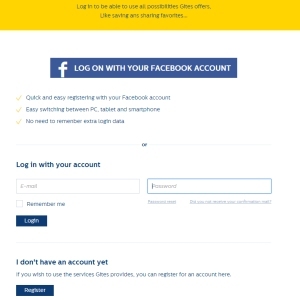 The advantage is that now you can also log in via your Facebook account to log on to your account on Gites.nl. 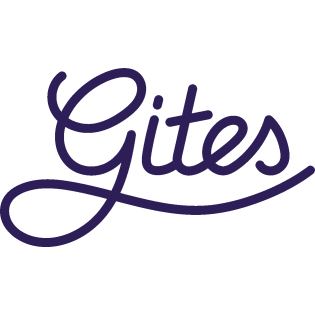 The condition is that the e-mail address you use to log in on Gites is the same as that of your Facebook page. Also, visitors to the website can login with their facebook page and then add your home to their favorites list. Of course this depends on the quality of your advert! The more attractive your ad the more often it will be on those favorite lists. And voilà: More publicity for your gites or chambres d'hotes. You can’t have missed it: the photos on your advert are now displayed on a very large format. Of course we’ve done this modernization to make your adverts more attractive, and most of you understood that very well. Internet users today have much better screens than before. Some photos on Gites are so attractive that here in the office we really start to feel like staying in one of those wonderful places! Your "additional photo book is now part of the carousel and will not be shown separately at the bottom of the page anymore. Some of you still refer to it in the text: please look closely at your texts. Your photo is enlarged and sometimes it appears very blurred. Surely you still have the original picture in your computer. Usually if you upload the original again, it will be sharp. If you replace one of the first five photos on your page, the old picture remains there until we have approved the new one. This is usually fairly quick and certainly within one business day. Important! Put yourself in the place of the visitor and imagine that you are looking for a holiday accommodation for your family. What do you check first? Photos of course, but surely you also want to know what others thought of this gite. Visitors of our website want to know how your gites or chambres d'hotes was reviewed by others. Make sure your guests are satisfied customers, and then ask them to write reviews - it all helps for better rental results. Even if they mention some possible improvements, you might want to place them in your online guest book and add your comment to how that you have taken the remark seriously and made the necessary improvements. 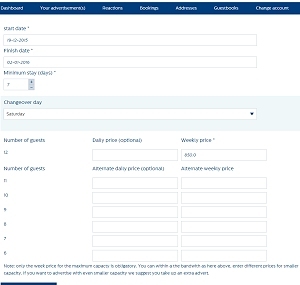 Guests can now also add a rate and an average rate over the last four years is shown. The availability calendar on the website has been modified so that it is now absolutely clear which periods are still available and which are not. 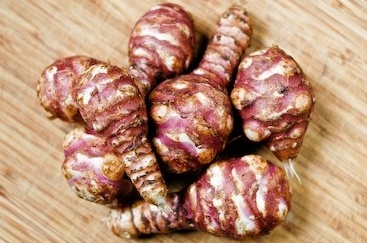 Faire cuire lesson topinambours dans le lait. Mixer avec le reste de lait de cuisson. Ajouter sel, poivre et piment. Parsemer de roquefort et des noix.